Arrowhead (Sagittaria platyphylla) of the Water Plantain (Alismataceae) family is an aquatic perennial of shores and marshes. It is one of eight Sagittaria species found in Arkansas that have “arrowhead” as their common name (see below). The genus name is from the Latin sagitta, an arrow, for the sagittate (arrow-shaped) leaves of some other species in the genus. The specific epithet is Greek for “flat-leaved.” This particular species of arrowhead occurs from Texas to Kansas, east to Virginia and south to the Atlantic and Gulf Coasts. In Arkansas, it is recorded pretty much statewide. Other common names include delta arrowhead, delta duck-potato, and broad-leaf arrowhead. Arrowhead is an aquatic monocot found on the banks and shallow waters of marshes, swamps, sloughs, and ponds where its roots are either in mud or underwater. Plants do not occur where flow rates are high or water depth exceeds several feet. Soils may be mucky to sandy. The bulb-like corm bears shallow fibrous radiating roots as well as shallow slender underground stolons that extend outward a foot or more. New plants are established at tips of stolons and from seed. Plants can spread aggressively. In slow-moving water, sediments become trapped so that water depth becomes more shallow. Established plants may totally disappear during dry conditions but reappear as wet conditions return. This arrowhead has three glabrous (hairless) leaf forms that are produced from the basal stem or caudex. Early in the growing season, submerged radiating strap-like leaves (a foot or more long and an inch wide), without petioles, are produced. With warming conditions, plants produce erect narrow strap-like emergent leaves (also without petioles) that extend a foot or more above the water surface, as if testing water depth. In the summer, broad emergent leaves are held well above the water surface on long petioles. If the water level rises above emergent leaves, these leaves tend to die-off. Photo 1: Early strap-like leaves are submergent. Several later-growing emergent strap-like leaves can be seen to the right. Photo May 17. Photo 2: Strap-like emergent leaves become dominant later in spring as submergent leaves decay. Plant in near foreground is wool-grass bulrush (Scirpus cyperinus). Photo April 18. The broad summer leaves have ovate to elliptical blades to 15 inches long and 4 inches wide with petioles to about 15 inches long. Some smaller emergent leaves may have lanceolate blades. Upper and lower sides of leaf blades, along with the petioles, are a medium green, with the lower side duller. Leaf blades have entire, thinly recurved margins, a rounded apex terminating in a small acute tip, and broad rounded bases (although occasionally with slightly flared bases). Midribs are a lighter green with abaxial midrib being strongly keeled while adaxial midrib is weakly keeled or suppressed. Widely spaced secondary veins are arcuate and trend toward the blade apex. Narrowly spaced tertiary parallel pinnate veins extend, at about 50 degrees off midrib, to leaf margins, seemingly crossing secondary veins unimpeded. The spongy petioles are triangular in cross-section, with one angle being the continuation of the abaxial midrib and the two lateral angles extending downward from the junction of the leaf blade with the petiole. The two lateral angles become increasingly “flappy” from the lower portion of the petiole down to the caudex, where they channel an emerging younger leaf. Photo 3: Emergent summer-time leaves have large blades and long triangular in cross-section petioles. Leaf bases are usually rounded, the apexes tipped. Note venation shown by large leaf. Photo July 17. Flowers are unisexual. Inflorescences, from spring into fall, develop alongside the leaf bases. Flowers are borne along the inflorescence axis in whorls of three, with pistillate and staminate flowers typically in separate whorls, and the pistillate lowermost. The inflorescence is significantly shorter than the broad emergent leaves. Each floral whorl is subtended by three broad, striated, medium green, connate (joined at their bases) bracts which, at first, totally cover developing whorls, but dry into tissue-thin persistent brown flaps as flowers reach anthesis. Male and female flowers (to ¾ inch wide), with three broadly rounded, green, cupped, persistent sepals (to ⅓ inch long) and three broadly rounded, clawed, white petals (to ⅝ inch long), are on ascending pedicels (from ¼ to 2 inches long) at time of bloom. Pistillate flowers, reaching anthesis before staminate flowers, have a prominent, slightly flattened, yellowish-green, globoid cluster of numerous pistils tipped with short styles, the tips angled toward the top of the cluster. Staminate flowers, on more slender pedicels, have multiple stamens with light colored filaments and bright yellow, two-part anthers. The pedicels of pistillate flowers strengthen and recurve downward as fruits develop, whereas those of staminate flowers remain ascending and fade after pollen release. Photo 4: Two lowermost whorls of both stems are pistillate. Pedicels of pistillate flowers recurve downward as fruits develop. Open flowers on the higher stem are staminate–note their more slender pedicels. Photo September 26. Photo 5: Staminate flowers have two-lobed yellow anthers. Higher-positioned immature whorls, at center of photo, also appear to be staminate. Photo June 7. Fertilized flowers produce a solid globoid cluster (to ½ inch across) of achenes. Achenes have small beaks (remnants of styles) that give the exterior of the cluster a roughened texture. Mature, flattened, 1/10-inch-long achenes have a bent-oblong shape, with the beak off-set to one side and with narrow lateral wings. The buoyant achenes are easily dispersed by water movement. They produce grass-like seedlings. Photo 6: Fruiting heads consist of numerous achenes. Achene beaks give heads a roughened texture. Photo November 17. For a water garden or boggy area, arrowhead may be a suitable addition. (Its aggressive nature should be understood before its introduction.) The plant propagates by seeds, corms, stolons and parts of stolons. A dense growth of arrowhead can provide welcome habitat for frogs, turtles and many insects and spiders. Arrowhead can survive periods of dry soil. 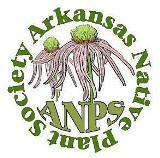 Along with Sagittaria platyphylla, the subject of this article, Arkansas has several other native species of arrowhead: Sagittaria australis, Sagittaria brevirostra, Sagittaria graminea (grass-leaf arrowhead), Sagittaria latifolia (duck-potato), Sagittaria montevidensis subsp. calycina, Sagittaria papillosa, and Sagittaria rigida (stiff-leaf arrowhead). Of these, S. graminea, S. papillosa, and S. rigida have leaf shapes that are similar to S. platyphylla. Sagittaria platyphylla can be distinguished from each of them by one or more of the following characters: 1) floral stems that are not branched, 2) floral stems that are shorter than the broad-emergent leaves, 3) broad-emergent leaves that have triangular petioles, 4) pistillate flowers and fruits that are not sessile, 5) fruiting pedicels that are recurved, and 6) bracts and sepals lacking papillae (short, rounded bumps). Three other native species in other genera may be confused with Sagittaria platyphylla, namely, creeping burrhead (Echinodorus cordifolius subsp. cordifolius), water plantain (Alisma subcordatum), and pickerel weed (Pontederia cordata, in a different, unrelated family). Sagittaria platyphylla can be distinguished from those species by its triangular stems that support three-whorled white flowers below the large emergent leaves. This entry was posted in Know Your Natives, Native Plants, Wildflowers and tagged Alismataceae, Aquatic, Sagittaria, Sagittaria platyphylla. Bookmark the permalink.